A mischievous chuckle is last thing we hear before the video of a guy who just tricked an undercover cop into buying literal flower buds (instead of weed) cuts out. It’s a confident reaction from a dude who has a couple of Glocks pointed at his head by cops leaning out of unmarked police vehicles. But then again, it took some guts to orchestrate a fake drug deal to expose an undercover cop in the first place. In a video uploaded to YouTube on December 28 by one “John Doe,” an undercover Troy, Ohio police officer posing as a weed buyer gets totally owned. The video begins in the driver seat of a Buick, with our guy approaching a vehicle he knows is an undercover. He reads out the make and model of the Toyota and the vehicle’s license plate. And then he gets out of his car and walks over. 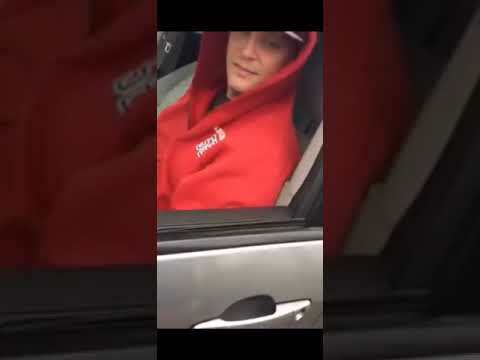 Sitting in an oversized red hoodie and an awkwardly fitting baseball cap, the undercover officer starts to initiate the transaction. You can tell the cop thinks something may be up. But he’s so desperate to book a guy for selling him a dime bag of weed that he starts to beg and ultimately, decides to accept the offer sight unseen. He hands off the cash and with the video running, takes the black bag into his car. Our guy says, “Yeah, you’re an undercover cop, aren’t you?” “Yeah—no,” the undercover cop replies. But by the time he’s about to drive off, unmarked police cars and SUVs—the same ones he identified in the beginning—surround him. Officers pop out guns drawn and tell him to get his hands up. One officer snatches the man’s phone away and the video cuts out. Now, that video is about to break 1,000,000 views. And it reveals the extraordinary lengths law enforcement will go through just to make the smallest weed bust. Police pointed weapons at a man’s head for suspecting him of selling a dime bag to an undercover cop. Meanwhile, legal cannabis sales in the U.S. alone are earning companies and their investors billions of dollars every year. Indeed, this video shows the truth of the banal, idiotic everyday reality of the so-called war on drugs. When it isn’t needlessly locking people up or shooting them dead, it’s on the hunt for the smallest of small-time crime. It’s wasting officers’ time and the public’s resources. And it deserves to be ridiculed and punked as savagely as it was in this video.